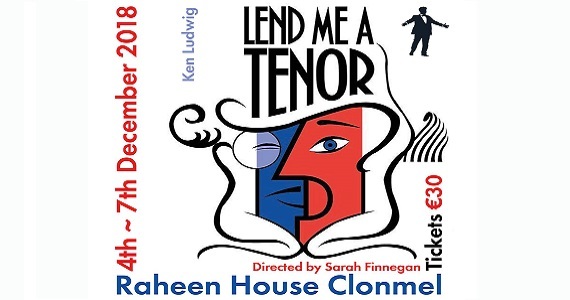 Clonmel Theatre Guild launches it’s 50th Season with our dinner theatre production of Ken Ludwig’s hilarious comedy “Lend me a Tenor”. Directed by Sarah Finnegan, it will be staged in Raheen House Hotel on 4th-7th December 2018. “Lend Me A Tenor” sees Henry Saunders, the general manager of the Cleveland Grand Opera Company, primed to welcome world famous, Tito Morelli, Il Stupendo, the greatest tenor of his generation, to appear for one night only as Otello. Tickets for “Lend me a Tenor” go on sale in Marian’s Bookshop (052) 6123813 on Monday 12th November 2018, price €30.00 and can also be bought online on this website. This is an excellent night out and a great way to kick start the festive season. Large groups catered for, please contact info@clonmeltheatreguild.org for more information on group bookings. A donation from the raffle will be made to The Emma Lacey Trust.